Dr. Unger’s goal in creating his own vitamins was to formulate them to specific neurological conditions using the most recent research and his own hands-on experience. He compounded the purest of ingredients in exacting amounts to allow his patients a two fold benefit – easy dosage, and cost effectiveness. He proud to now be able to offer them to the general public. On the surface it is rather difficult to tell the difference between "synthetic" and "natural" vitamins. Synthetic vitamins are made in a laboratory setting from coal tar derivatives. 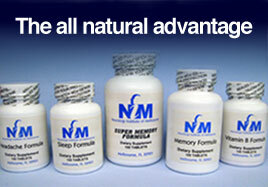 A natural vitamin is a concentrated nutrient derived from a quality natural source. The benefit is maximum absorption of the natural material; no artificial preservatives, colors, or sweeteners, are used. Our Supplements, now available to you! A study in 2000 shows that Vitamin E does slow the progression of Alzheimer’s disease. Choosing the right form of Vitamin E is as important as the reason you are taking it. The synthetic form is labeled differently but sold for similar goals. Vitamin E in its synthetic form is only HALF as active as the natural form. This means that you would need to take twice as much of synthetic Vitamin E to accomplish the same results as Dr. Unger’s natural Vitamin E.
Dr. Unger has done the research to find the best blend of natural Vitamin E and Vitamin C to distribute to his patients. Now you can have it too. Melatonin is a natural occuring hormone found in everyone. It is important in the regulation of the circadian rhythms of several biological functions. A circadian rhythm is an approximate daily periodicity - a roughly-24-hour cycle in the biochemical, physiological or behavioural processes of living beings, including plants and animals. This chemical, in controlled amounts, can essentially regulate when your body thinks it is time to sleep or wake up. The neurologic symptoms of vitamin B12 dificiency can include numbness and tingling of the arms and, more commonly, the legs, difficulty walking, memory loss, vision loss, disorientation and dementia and with mood changes. Many people receive B-12 shots to help with B-12 deficiency. These injections can deliver high dosages of B-12 into the body very quickly. What many people don’t realize is that you can get the same benefits with out costly shots by using supplements regularly. Feverfew has been used for centuries for treating headaches, arthritis and stomach problems. By reducing the release of serotonin and prostaglandins, feverfew will inhibit the inflammation of blood vessels in the head. This reduction in serotonin and prostaglandins helps eliminate the onset of migraines. By stopping the blood vessel spasm that contributes headaches, feverfew will reduce the frequency of headaches as well. Carpal Tunnel Syndrome is a condition where a pinched nerve in the patient’s wrist causes the patient to have numbness, weakness and pain in the hand which can be quite disabling over time if not diagnosed and treated early. Recent studies have shown that higher doses of vitamin B6 can help carpal tunnel syndrome. Do Not Take More Than 200mg of Vitamin B6 per day because it can lead to neurologic problems.